The climate you have in Sandy Springs, GA is hot humid summers and cold winters. With the seasonal changes the soils will expand and shrink due to temperature and the amount of water in the soils around your foundation. This can cause settlement issues with your home’s foundation. If you start to notice your doors sticking or your windows are getting harder to open, you may have a foundation problem. Other signs would be wall, tile, or floor cracks, foundation cracks, sloping floors, leaning chimneys, or stoops and porches pulling away from the home foundation. These are all signs that would warrant a call to your local foundation repair team at Atlas Piers of Atlanta. Our professional staff is well versed in all types of foundation repairs from concrete and masonry repair to grouting injections and underpinning. Atlas Piers can fix all your foundation problems. We install and specialize in underpinning, helical piers, resistance piers, and shoring to name a few. We have quality products we can have your home fixed up in no time. We only use the very best in underpinning products from the industry leader – Earth Contact Products. With their products and our trustworthy and well trained staff we can have your repairs done in no time, with little or no disturbance to your home and landscaping. 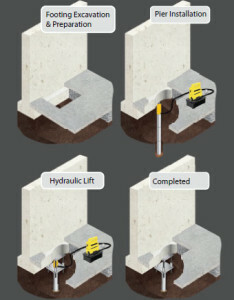 Our underpinning services can be used to effectively lift and stabilize a sinking foundation. First, the piers are driven into the ground until it reaches the stable soil located far below the shifting top soils. Next, the weight of the structure is transferred onto the piers and they are used to lift the foundation to its original position, stabilizing it at the same time. To encompass every type of foundation repair situation, we offer a variety of piers: steel push piers, helical piers, slab piers, and porch piers. Other foundation repair solutions that we offer include: pressure grouting, helical tiebacks, and carbon fiber repairs. Pressure grouting is a grout injection method that is used to fill voids that may have developed under your foundation. In this simple process, a grout is injected under the foundation, filling voids to lift and stabilize the foundation. Helical tiebacks are often used to repair bowing or leaning walls. These devices are anchored into the ground next to the wall and attached to the wall. They apply horizontal pressure opposite to the direction of the lean to straighten the wall. Carbon fiber strips are another method that can be used to fix leaning or cracking foundation walls. These strips provide the wall with strength and stability, locking it in place and closing any cracks that may have formed. We offer a host of other foundation and new construction options for you too. A good foundation from the start is so important to the overall well being of your home. We can build your foundation and help with our shoring processes to make sure your foundation is perfect from the get go. For crawl space encapsulation, we are also your professional team! We can setup encapsulation and vapor barriers so your crawlspace is dry all the time. You will then be able to use the area for storage, adding livable square footage to your home. This will also lower your utility bills and make sure the air in your home is clean. When you remove moisture from your crawl space, there will be no mold or mildew to speak of. This is perfect for your family. So for all your needs, whether it be new construction, residential repair, or commercial repairs, we have you covered. All of your foundation repair needs in Sandy Springs Georgia can be handled by the professionals at Atlas Piers. Call Atlas Piers of Atlanta today.